Using our GC Saturation Indicator is an easy method to detect contaminant breakthrough in a carbon bed. 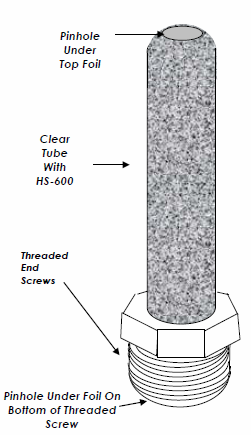 The indicator is constructed of a clear tube filled with our HS-600 media. This media is a bright purple color when new and changes to brown as it becomes used. The indicator screws into a sample port using the 3/4″ MPT connection at a point where the air effluent can pass through it after it has been treated by the carbon bed. Before use, the foils on this MPT connection and on the top of the tube need to be removed so the air can flow through the pinholes. Once the media in the tube has completely turned brown, it can be assumed that the carbon bed is either spent, or getting close to breakthrough.